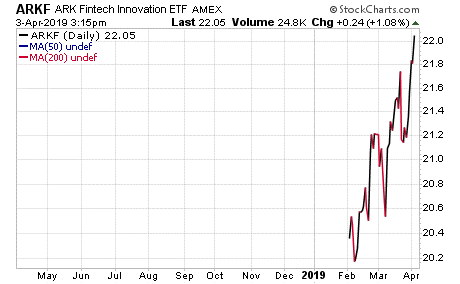 The Ark Fintech Innovation ETF (ARKF) is an actively managed exchange-traded fund (ETF) that seeks long-term growth of capital by following the theme of Innovation in Financial Technology. The fund invests at least 80 percent of its assets in domestic and foreign equity securities of companies that are engaged in the fund’s investment theme of Innovation in Financial Technology. That growing category also is known as FinTech innovation. “A company is deemed to be engaged in the theme of FinTech innovation if (i) it derives a significant portion of its revenue or market value from the theme of FinTech innovation, or (ii) it has stated its primary business to be in products and services focused on the theme of FinTech innovation,” according to Ark. In other words, FinTech innovation features new technologies that change the way traditional financial services or products function. Examples of FinTech innovations include Transaction Innovations, Blockchain Technology, Risk Transformation, Frictionless Funding Platforms, Customer Facing Platforms, and New Intermediaries. The top five sectors for ARKF include Technology, Financial Services, Consumer Cyclical, Real Estate and Industrials. The fund’s top holdings are in Square Inc. (NYSE:SQ), LendingTree Inc. (NASDAQ:TREE), Tencent Holding (OTCMKTS:TCEHY), Apple (NASDAQ:AAPL) and Amazon (NASDAQ: AMZN). The fund has $56.99 million assets under management and an average spread of 0.13 percent. It has an expense ratio of 0.75 percent, meaning it is relatively expensive to hold in comparison to other exchange-traded funds. ARKF is fairly new and only became available as an investment on February 4, 2019. It since then has seen a few slight downturns, but mostly has been on an upward climb. The fund is currently up 6.9 percent. However, as always, conduct your own due diligence to decide whether or not this ETF is suitable for your portfolio. Amidst news of Joe Biden's "weird and uncomfortable" behavior around women, investment expert Jim Woods reveals his past with the previous vice president, detailing his bizarre eating habits.